THE operator of the Breitling score board at the far end of Wembley Pool was working hard as laps were won and lost at a furious pace during the final madison of the third Skol International "Six". Commentator David Duffield, always a fast talker, was somehow finding another 30 words a minutes to get it all in. Mechanics and trainers were on the alert. Deck-chairs on which riders had lounged during easy spells were stacked behind the cabins. Tea and beer bars were deserted. That last hour and a quarter was a beauty, spectacular and real; 11 teams involved in that splendid concentration of every possible form of cycle racing, the Madison. There we had the champion of the world Sercu sprinting as only he can to put the finishing touches to a lap-stealing raid launched by partner Post; or a world class pursuiter like Hugh Porter reaching the same end by a slightly slower but still mighty effort; or the roadmen, epitomised by Bill Lawrie getting relatively stronger as time wore on. Or four all-round track riders like Eugen and Lykke of Denmark, and Bugdahl and Kemper of Germany, who have blended themselves into the harmonious compound of the six-day team. While the Breitling man was working overtime keeping pace with the race on the electric scoreboard at one end of the stadium, the fellow in charge of the village-green cricket type indicator at the other was watching the race in peace. His job was over. There were no more official sprints, and point-wise the scores could not change. The points scores told a story: that the British sprinters Gowland, Clarey and Bull-Hill had been having a go at each other all the week. Their high totals were welcome proof of increased confidence and speed, because they had not only been having a go at each other, but at world champion Sercu as well! Also involved in the 10 nightly sprints had been Gilmore-Lawrie and it was only in the last series that Sercu put his team in the lead by one point over the Australians. That one point was worth a lot. It meant that to win the race for the second year running, Post-Sercu had no longer to finish a lap up on the Australians, but to finish level with them on distance. Additionally, of course, Post-Sercu had to make sure neither Kemper-Bugdahl nor Eugen-Lykke took a lap from them. The Porter Severyns threat, while not formidable, was still serious enough to warrant close attention. one lap back. In the process, the remaining teams were losing laps, and while the stars took a breather, most of the supporting cast regained a bit of their lost ground only to lose it as soon as the Big'Uns went into action again. This was a real madison, and the first result of its severity came when the Danes failed to respond to the follow-my-leader pattern. Instead of chasing the tail of the field, they became part of the tail. Then it was the turn of the Australians to miss out a turn, and so we had only two teams in the lead Post-Sercu and Kemper-Bugdahl. These two teams were joint favourites before the race started. To win, the Germans had now to gain a lap on Post-Sercu and keep it until the end. For 20 minutes it seemed that this could happen, because it was the Germans who took the initiative. In the lead by a lap, they would renew the attack as soon as Post-Sercu were on the tail of the field to draw level. There is only one answer to this classical pattern of defence by attack, and that is for the challengers to throw everything into the old one-two, a double-lap gain, and this Post-Sercu did magnificently. In due course the Germans drew level, but from then until the end were firmly under the control of the Dutch-Belgain pair. During this show-down the Danes had dropped down alarmingly, Lykke eventually retiring to allow Eugen to make up a new team with Seeuws who had also lost his partner Proost. The Australians, too, had slipped and were now sharing the three-laps-back scoreboard line with Porter-Severyns. With Post-Sercu controlling the Germans and the first two positions firmly buttoned up, the thrills of the last ten minutes were provided by the Australians who pulled back to two laps with one splendid burst (which also won them a f50 prime) and then again to take another with only 20 laps to go. Although the formula of the 3rd Skol International only required the riders to race at a 5-hour track meeting on six nights in succession with a Saturday matinee, the test was a valid one, with a true result. The emphasis on the madison racing meant that it was far harder than the two previous events under the same sponsorship, and some of the insufficiently prepared continentals suffered accordingly. Whereas previous winners Lykke-Eugen were under form, Post and Sercu were in great shape. Just a month earlier Sercu had regained his world sprint champion in the Antwerp Sportpaleis where Peter Post rode the pursuit event. Although caught by Hugh Porter in the semi-final. 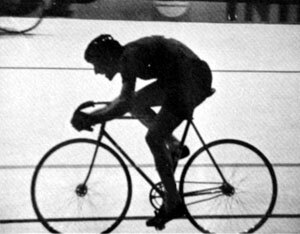 Post had ridden the 5,000 metres in 6m 8s in an earlier round. Porter, too. came to London still full of his splendid Antwerp form That was no surprise to all followers of the sport. What was so welcome was to see the tremendous improvement of the tall Mackeson man in the art of handling his bicycle on the little track. On the programme it said that Hugh Porter could not wish for a better partner than Emile Severyns. So far as experience goes, then Hugh undoubtedly was glad to be with the Belgian who, at 38, was the oldest man in the race and has won 25 six-day events. The near-vet, however, was one of those six-day specialists who was certainly not on the best of his form during the first week in September - otherwise he and Porter would surely have been less than three laps adrift on final standings. If Porter was the classiest of the home riders, Tony Gowland was certainly the most spectacular. His scraps with Sercu throughout the week in the final of the "Devil" and in the B.B.C. Late Night Extra Trophy series were great stuff, and the very last sprint at the end of the race had the crowd on its feet not only in appreciation of Sercu's champion win, but Gowland's frenzied challenge. 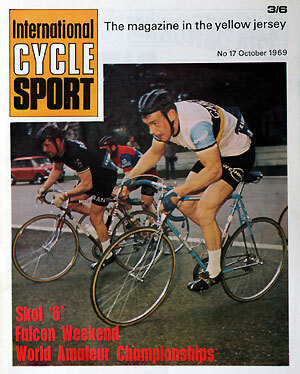 One night I sat with a friend high up in the stadium watching a BBC sprint; Sercu won from Gowland, and it was as fine a spectacle as I have seen in 40 years association with cycle sport. Gowland, along with Trevor Bull, Norman Hill and John Claret' have all made great progress on the boards, and after a very shaky start Albert Hitchen lasted out until the end with great courage. Each of these riders made a real contribution to the ace, whereas before the war most of the British riders engaged at Wembley ended up in hospital. But - Porter apart - although the home men played their supporting parts well, in the sprints, Devils, primes and showed prowess behind the Dernys - they still have obvious limitations when the six-day race gets down to business in the Madison. A glance at the 10-30 p.m. position given at the beginning of this story, and that at the finish, will show what I mean. But the crowd still had "home" riders to cheer in the big Australian Bill Lawrie (who is British national road champion) and his partner Graeme Gilmore. Although not quite up to the Strom-Arnold standard they have a certain affinity with their two compatriots who did so well on European winter tracks in the late '40s and early '50s the shorter one Gilmore (like Arnold) being the speed merchant and the big fellow Lawrie (like Strom) the solid support. With their considerable road background, I believe Lawrie-Gilmore would be seen to better advantage in six-day races on 200 or 250 metres tracks where laps take three times longer to gain that at Wembley. Hugh Porter and Trevor Bull would also be seen to better advantage on bigger tracks. Finally a word about the 12th team in the six-day race. Ward-Webb. It was through their enthusiasm and perseverence that the third Skol International took place at all. They got the whole thing going in eight weeks. Dan Ward, the North Road CC's tearaway PRO sprinter getting an idea and working on it without a minute's delay. Ron Webb, the Australian organiser, quietly going about his job with necessarily more deliberation than Dan but with equal determination and authority. Ward-Webb won their six-day battle admirably: No lapse and Full Points. THE best way not to see a six day race is to be a runner for a big team. You are at their beck and call for six days and nights. It's shattering physically and mentally but it's great, second only to riding for the knowledge and experience gained. Running this year at Wembley for Bughdal-Kemper was a great improvement on last year's assignment BugdahI-Beghetto, Beghetto being notoriously difficult. Bugdahl, the meticulous, set the fashion for cold porridge, imitated by Post. Sercu, etc. He likes yoghurt when it's not available, toothpicks (the fifth chemist I tried had some), weak tea poured out an hour before, dry raisins - he supposedly liked them; must have been last year's they were so dry. Kemper, not slapdash, just carefree - he had a three week old Mercedes 280SL - has an English frame, two sheets of Skol lager tin to tighten the seat pillar, track ends the wrong width making main adjustment difficult but unlike other teams we didn't have any loose sprockets. Kemper, for 12 years a notable swimmer and polo player, has a favourite trick. He will take a drink one lap, still holding the bottle be relayed into the chase the bottle flying out, water polo fashion, all in about three seconds flat. Let the tyre pressures drop, forget to change the water, or wash the fruit, mix up the jerseys, rub him down too hard or too soft and a verbal rasp will be your thanks. I obtained tape from a film unit for the handlebars - for two days their hands stuck. Sponge down the tyres every time, check for cuts, keep the new tape clean, polish the chrome, sweep the floor, keep your hands clean, make sure the biscuits don't get soft. Don't spill the Cologne but use more not too much massage oil - don't touch your eyes its poisonous. Thank goodness 'grapes for Beghetto' are off this year. Keep the footbridge going, the mini-skirts keep everybody's spirit high. With no soigneur or mechanic life gets hectic but with help from a clubmate who learnt more than in two years riding, we found ourselves table waiting on half a dozen teams at once - other teams please follow Post's example who tipped generously. The biggest laugh were Darby and Joan washing up; Messrs. Armor and Kilvington noted complainants at the best of times - the more they sweated the more lager they drank the more they sweated. I hope Gowland's caught up with his sleep. Keep someone else up until five o’clock each morning next year please, Tony. Jan, the chef this year, made the best of a difficult job, these riders expect the best and get it. Every meal was a crisis, explosive but hilarious. One runner, fed up with running, fancied eggs for breakfast served personally by the chef. He got them - raw eggs, on his head. After chicken four times running I dared ask for steak; told to eat bread and jam I was on my second loaf when Jan brought out four steaks - at 2 a.m! Who hid Derksen's brief case in the slop bin ? Who else could get away with that? - Peter Post. Who gave P.P. a mug with a hole in it - Hughie Porter and didn't get away with it. One mid race party lasted until 6 a.m. the riders concerned kept a remarkable pace considering. Post doesn't miss a thing, all the time he's circling the track one quizzical eye watches everything. If Engers did nothing else, his silver polythene shirt caused a riot. Kemper's brother has done 4-52 on 51x15 indoors so there was nothing wrong with Alf's gear but he should not use silks*. I obtained athletic running shoes much to Kemper's amusement, the next step will be roller skates. The runners can't afford to let up, you don't get paid until afterwards. Albert Hitchen's (Alfred Hitchcock to Kemper) courage can never be in doubt - the look of fear and trepidation on every lap proves that; he did not smile until the last night. Norman Hill has four degrees of pained facial expression lent colour by his blacked eye. That's it really, except I can't sleep at nights and when I do I just dream (nightmare) of lap after lap, change after change, and cheer after cheer. Keep on cheering. * After catching Peter Post in a special pursuit event during Sunday's charity evening, Alf Engers rode a 4,000 metres time trial before the start of the final session. Using a gear of 90 inches, the Polytechnic C.C. amateur recorded 5m 14 sec.